Welcome to another installment of WHAT'S ON NETFLIX?, where we pick out a film currently playing on Netflix and review it for the fans. This time we're ruminating on the third installment in JJ Abrams' incomprehensible Cloverfield series, THE CLOVERFIELD PARADOX. So you probably know by now that there's a third Cloverfield movie, after Netflix released The Cloverfield Paradox on an unsuspecting world immediately following this year's Super Bowl. Initial reactions have been unfavorable; as of this writing, the movie has a 17% on Rotten Tomatoes and a 35 on Metacritic. And as much as I loved the first two installments in this series, I have to agree that this one is the weakest so far, but I wouldn't call it bad, necessarily. 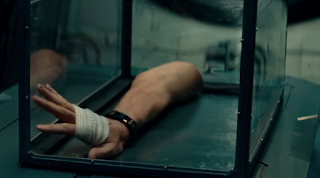 The Cloverfield series began in 2008 with a found-footage film of that name, and while it didn't see huge success, it gained a following thanks to its sustained sense of mystery and unrelenting tension, as a going-away party turns into a night of horror through a series of disasters that turn out to be the work of strange creatures that are apparently aliens. A sort-of sequel, 2016's 10 Cloverfield Lane delivered a solid follow-up, with a young woman being held against her will in an underground bunker by a doomsday prepper (played by John Goodman) who turns out to be not as crazy as he seems. That film ends with the indication that humanity is getting wise to the alien creatures' shenanigans, and a resistance is brewing. But we still have no idea where these creatures, which we still have yet to get a good look at, even came from. The Cloverfield Paradox is set in a Near Future (whatever that means to you) where all those old favorite Energy Doomsday prophecies are coming to pass. Electricity is in short supply, and oil is running low to the point that gasoline is a rarity. But fear not! A new experiment is beginning aboard the space station Cloverfield (yes, that's its real name) that, if successful, will mean Free Unlimited Energy For All! Not everyone is feeling optimistic about this grand experiment, including one particular Negative Nancy played by Donal Logue, Gotham's Detective Bullock, who is getting fifteen minutes of fame predicting that the Cloverfield Experiment will damage the fabric of space-time and wreak untold and unknowable buggery across not only this world, but all dimensions. But of course no one's buying his schtick. That kind of stuff is crazy talk! Nothing can possibly go wrong! The space station is crewed by a gang of "That Guy Who Was In That Thing" actors. You're bound to recognize at least a few, but I feel I should warn you that included among them is Daniel Brühl, who I prefer to remember as Niki Lauda from 2013's Rush, but who everyone else will remember as Zemo from Captain America: Civil War. So don't watch this with anyone who still thinks "Mission Report: December 16th, 1991" is a hilarious meme. Anyway, our plucky crew goes to work, and for the next two years they try and fail to start their experiemental particle accelerator, the thing which will render the aforementioned Free Unlimited Energy for All. Or FUEA, which I just realized sounds like "phooey", so I declare that henceforth the accelerator shall be known as the Fountain of Phooey. My review, my rules. After the requisite montage, we come back to our now less-optimistic crew to learn that the station only has enough fuel for three more attempts to fire the Fountain, meaning that, by the laws of American moviemaking, victory is in sight. Stuff like this never works until the the last try. But they have two tries to go before that last one, and its the next try that really gets the story going. As the Fountain winds up, something happens and the next thing anyone knows, Earth is gone. What went wrong? We never find out. This is a Cloverfield movie, remember; if you want to understand what the heck is going on, watch something else. Fortunately, we will learn what has happened to the station, but plenty more weirdness will happen before then. A colony of earthworms, which were brought along on the mission for some reason, will disappear briefly, only to turn up again in an unlikely place. The crews' relationships will deteriorate in finest space disaster movie style. A woman, who wasn't previously among the crew, will appear in the wall and be instantly accepted into the crew at large. A 3D-printed gun will work, repeatedly. Weird-for-weird's-sake seems to be the order of the day, as strange occurrances pop up for no apparent reason other than the writers thought it sounded cool. And those moments are bizarre, but it's pretty clear they're mostly just filler to pad the runtime while the movie spins its wheels. This story is predictable, and it comes to the predictable ending. Of course, they're going to make it back home, we'll get to that. But right now, oh, look! A severed arm! And it's still moving! Isn't that weird? 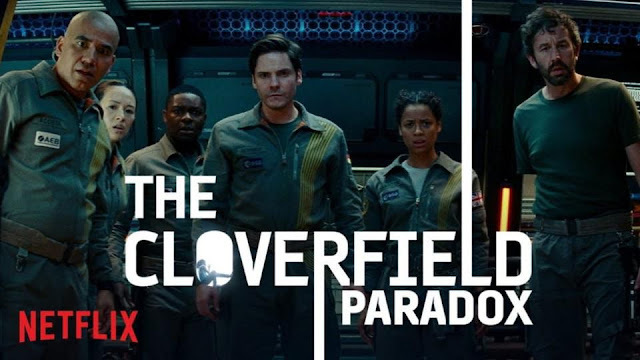 I've read other people's comments that said The Cloverfield Paradox doesn't feel so much like a movie, as it does an episode of a TV show stretched out to feature length, and I agree. This could have been an episode of Black Mirror, if not for Cloverfield's resident megafauna making a last-second appearance just before the credits roll. That said, The Cloverfield Paradox does remind me of other movies, mostly all the "strange stuff happened because science" movies of the fifties and sixties. I'm not mad at that; the relentless march of scientific progress can be frightening, and people will always be attracted to stories of how all those new theories and experiments can go wrong. My problem is that bit of foreshadowing about how this film's experiment will cause havoc "across all dimensions", which basically means future installments can throw continuity to the winds and just keep rehashing the mystery of these beasties in perpetuity. And rehash it they shall, since a fourth Cloverfield movie is already being teased. The mystery of the monsters is all well and good, but three movies later its clear this story is destined for a climax in the style of Godzilla or Pacific Rim, and I'm getting a little tired of the foreplay. 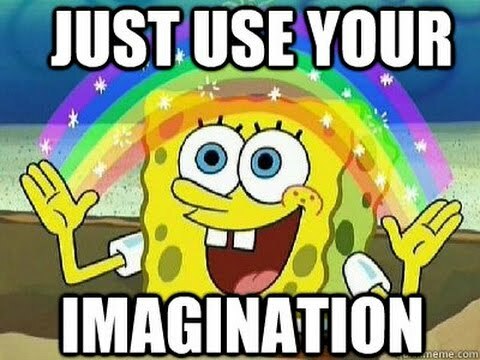 Stop trying to be all intellectual and sneaky, JJ Abrams, and get on with the giant monsters doin' stuff! Hopefully the next installment will get back to moving the story forward, if only by inches, and this is just a prequel to remind us that the series isn't dead. I don't not like this movie, but I can't see it as anything more than a disposable entry in a series that has shown it can do better. So for now I'm taking the attitude of Jack Nicholson in Mars Attacks: Two out of three Cloverfield movies are memorable, and that ain't bad. The Cloverfield Paradox is rated TV-MA. Labels: cloverfield, Daniel Bruhl, David Oyelowo, J.J. Abrams, Movie Reviews, Netflix, Sci-Fi, The Cloverfield Paradox, What's On Netflix?